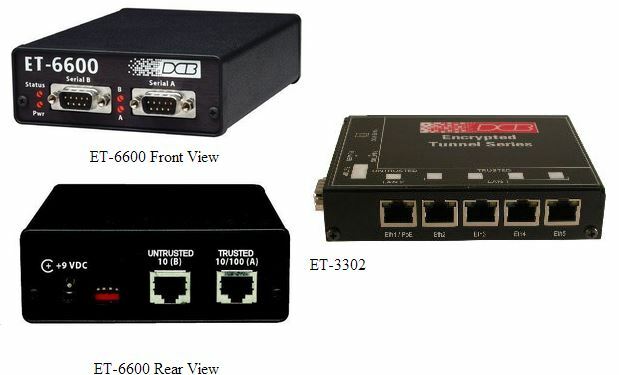 DCB provides a diverse line of security and encrypted communications products ranging from high speed encrypted multi-point ethernet bridges to simple serial RS-232 encrypters. . The ET-3302 bridge provides an encrypted Ethernet tunnel between two or more ethernet LANS. The connection between the devices may be any valid TCP/IP connection, including wireless and Internet. The ET-3302 bridges all Ethernet protocols without the complexity of a full VPN install. The ET-3302 uses AES encryption and interoperates with the entire ET family of secure briding products. It is available with a wide variety of power supply options. The SE-6600 is an industrial rated serial data encryption device featuring two serial ports, a device port and a network port. The SE-6600 uses AES 256-bit encryption, 128-bit block size, to encrypt point-to-point and multi-point lines using any serial media that terminates in RS-232 connections with throughput up to 115.2 Kbps. The SM-56 is an industrial rated high security dial-in/out modem. It is easily configured to meet the new NERC CIP security perimeter dial-in requirements as well as other higher security modem needs. With features such as one-time passwords, AES shared key mode, and logging; it may be used as any other simple modem or configured for high security uses. The UT-3302 bridges provide an encrypted Ethernet tunnel between two or more ethernet LANS with throughput of 10 Mbps or greater. The connection between the devices may be any ethernet network, broadband, wireless, etc. Industrial rated. The UT-3302s bridge all Ethernet protocols, including multi-cast, without the complexity of a full VPN install. The UT-3302 uses AES encryption. It works well in pairs, multiples, or along with the high performance UT-6602. Both are available with a wide variety of power supply options.